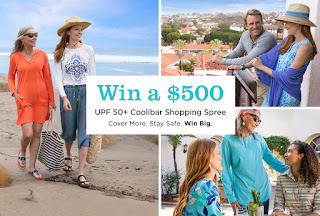 Prize & Approximate Retail Value ("ARV"): Five (5) separate winners will each receive one (1) $500 shopping spree on coolibar.com for Coolibar-branded UV clothing, hats and accessories to be redeemed in one transaction (excludes all third-party brands). The $500 award expires 5/24/2019. The total ARV for all prizes in the Sweepstakes is $2500.